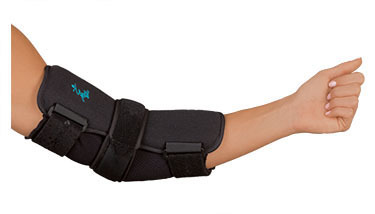 Low-profile night splint that comfortably holds the elbow in a neutral position for the treatment of cubital tunnel syndrome. Features an adjustable aluminum stay, ventral design to enhance sleeping comfort, and V-Strap retention system. Fits either the right or the left elbow.